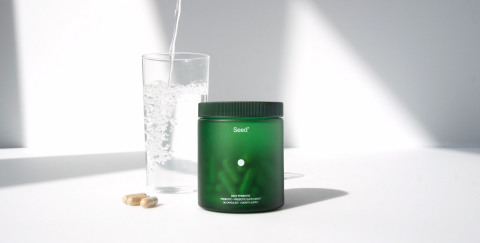 LOS ANGELES--(BUSINESS WIRE)-- Seed™, a new microbiome company, launches today with the mission to set a new standard of scientific rigor and consumer education in the $38 billion global probiotics industry. Seed today also announces its first product, Daily Synbiotic™, a probiotic and prebiotic with both a female and male formulation. Seed’s team is led by Co-Founders and Co-CEOs, Ara Katz and Raja Dhir, and includes Chief Scientist, Dr. Gregor Reid, a pioneer in microbial sciences with 35 years of research, who chaired the United Nations - World Health Organization panel that first authored the global definition of the term ‘probiotics.’ Seed’s approach is a paradigm shift, bridging microbiome science and consumer health to bring much-needed precision, efficacy and education to consumer probiotics. “The study of the microbiome is redefining health and radically transforming our approach to medicine, hygiene, diet, living, and the choices we make. In the coming years, bacteria will impact almost every aspect of our lives,” said Katz. Seed’s Scientific Advisory Board is comprised of leading scientists with expertise in microbiology, immunology, genetics, metabolomics, gastroenterology, pediatrics, environmental sciences and women’s health. Seed’s pipeline targets specific developmental stages and ecosystems of the human body. The Seed platform combines human clinical trials, GI simulation models, human cell line testing, short-chain fatty acid testing, whole genome sequencing, innovations in biofermentation and stabilization, and testing protocols that adhere to the highest regulatory standards worldwide. Seed’s global supply chain includes academic and industry partners across Europe, Japan, Scandinavia, India, and the United States. Seed’s Daily Synbiotic is the first to take a ‘microbe-systems approach’ with strain-specific benefits beyond digestive health, including cardiovascular health, dermatological health, immune function, reproductive health, gut barrier integrity, and oxidative stress. The female formulation is the first probiotic on the market to increase folate production. Validation: Benefits are verified by more than 20 strain-specific, peer-reviewed, double-blind published studies in combination with gut simulation models, whole-genome sequencing, human cell line and short-chain fatty acid testing. Probiotic Strains: Naturally-occurring probiotic strains not found in yoghurt, fermented foods, or ‘probiotic’ beverages, that are scientifically validated to demonstrate an effect in the body regardless of an individual's existing microbiome. Seed’s strains originate from Italy, United Kingdom, France, Belgium, Spain, Japan, and the United States and have GRAS and/or QPS status under the European Food and Safety Authority (EFSA). They are not cultured with, and are free from the 12 Classes of Allergens defined in Annex IIIa of Directive 2007/68/EC.Directive 2007/68/EC. New Class of Prebiotics: Exclusive, non-fermenting prebiotics sourced from Indian pomegranate skin and Scandinavian chaga mushrooms and pine bark. Delivery: Patented, proprietary algae delivery system ensures specific strains survive and remain viable in transit through digestion with no synthetic or chemical coating. The delivery system also confers 18 month shelf-stability, so no refrigeration is required up to 26°C / 79°F. Price: The Female and Male Daily Synbiotic are uniformly priced at $49.99 per one month supply of 90 capsules (adults take three capsules, once a day) with a Seed subscription. “Beneficial microbes can play a systems-wide role in human health alongside diet, exercise, and lifestyle. But as global consumption continues to grow, consumers are increasingly confused by the true health benefits and potential of probiotics. Our products reflect a commitment to reclaim the term ‘probiotics’ for science and to establish a new standard,” said Dr. Reid. Seed’s Daily Synbiotic is available exclusively at www.seed.com and is the first in the company’s pipeline of scientifically-validated products that will continue to roll out in 2019. Seed was founded to pioneer the application of microbiome science to improve human and planetary health. In collaboration with leading scientists and a global network of partners and experts in biofermentation, stabilization and testing, Seed is setting a new standard in bacteria. The company is co-founded and led by Ara Katz and Raja Dhir, and joined by a team of seasoned scientists, clinicians, advisors, partners, and investors across life science, biotech, academia, diagnostics, consumer health, consumer packaged goods, and media. Institutional investors include BOLD Capital, 8VC, Founders Fund, Collaborative Fund, Greycroft, The Chernin Group, Box Group, and Cross Culture Ventures. Learn more at www.seed.com. Ara’s breastfeeding experience led her to the microbiome and inspired a personal mission to explore the importance of microbes and how they can impact the health of our bodies, our children and our planet. A serial entrepreneur, Ara previously co-founded and served as CMO of mobile commerce marketplace, Spring. Ara was also on the founding team of social commerce company, BeachMint, where she launched six direct-to-consumer, influencer subscription brands. Ara has been a fellow at the MIT Media Lab’s Center for Future Storytelling and CCA's DesignMBA program, and was named in Marie Claire’s “The New Guard: The 50 Most Influential Women in America,” listed on Business Insider’s “Silicon Alley Top 100” and “36 Rockstar Women in NYC Tech.” She also advises startups across the health, tech, and consumer verticals. Raja leads Seed’s research strategy and academic collaborations, clinical trial design, product development, and intellectual property strategy. He is the architect of the Seed Platform and has unique expertise translating scientific research for product development - including patented inventions to stabilize sensitive compounds to improve human microbiome diversity and inflammatory biomarkers. Raja is also the Co-Chair of Seed’s Scientific Advisory Board with Dr. Jacques Ravel, and Co-Director of Seed Labs with Dr. George Church, where Seed focuses on applications of bacteria to solve complex ecological problems including honeybee colony collapse, plastic degradation and soil fertility. Raja serves on the Editorial Board for the scientific journal, Microbiome, on the Industry Advisory Committee for the International Scientific Association for Probiotics and Prebiotics (ISAPP), and is a member of the New York Academy of Sciences (NYAS), the American Society for Microbiology (ASM) and the American Association for the Advancement of Science (AAAS), among others. Dr. Reid specializes in beneficial microbes, and the novel probiotic therapies he has developed are used by patients worldwide. Dr. Reid is best known as the Chair of the United Nations-World Health Organization Expert Panel on Probiotics, leading the group that authored the globally accepted definition of probiotics. Dr. Reid is also the past-President of the International Scientific Association of Probiotics and Prebiotics (ISAPP), has authored over 500 peer-reviewed papers and has been awarded 28 patents. He is a reviewer for 28 international agencies (including the National Institute of Health) and 65 scientific journals, and is an inductee into the Academy of Science in the Royal Society of Canada. Dr. Reid has dedicated his life to applying his research to help others, with a focus on women’s health, and by demanding that probiotics reach people less fortunate in the developing world. Dr. George M. Church is a world-renowned geneticist, molecular engineer, chemist, and the Co-Director of Seed Labs. He is currently the Robert Winthrop Professor of Genetics at Harvard Medical School and Professor of Health Sciences and Technology at both Harvard and MIT. Dr. Church was a founding member of Harvard’s Wyss Institute for Biologically Inspired Engineering and serves as Director of the U.S. Department of Energy Technology Center, the National Institutes of Health Center of Excellence in Genomic Science, and an IARPA BRAIN Project. Dr. Church is widely credited for pioneering the specialized fields of personal genomics, synthetic biology, and genome engineering; his 1984 Harvard PhD introduced the first methods for direct genome sequencing, molecular multiplexing, and barcoding. These innovations led to the first ever full genome sequence in 1994, a landmark contribution that launched a new generation of DNA sequencing methods. In 2015, Dr. Church and his team successfully copied woolly mammoth genes using the CRISPR DNA editing technique, marking the first time a mammoths genes were functionally active since the species became extinct. Dr. Church has received numerous awards including the 2011 Bower Award and Prize for Achievement in Science from the Franklin Institute and election to the National Academy of Sciences and Engineering. He has co-authored 453 papers, 105 patent publications & one book. In 2017, he was listed as one of the 100 Most Influential People by Time Magazine. Dr. Ravel is the Associate Director for Genomics at the Institute for Genome Sciences (IGS) and a Professor of Microbiology and Immunology at the University of Maryland School of Medicine in Baltimore, Maryland. His research is focused on applying modern genomics technologies and ecological principles to characterize the role and dynamics of the microbial communities inhabiting the human body in health and disease, and better define the interactions between the host, the microbes and the environment that drive these ecological systems. Specifically, he examines the relationship between the microbiome and women’s health. Dr. Ravel’s work is part of the White House’s Human Microbiome Project, a long-term National Institutes of Health-funded project to examine the human microbiome and its relationship with the body and health. He received his PhD degree from the University of Maryland College Park in Environmental Molecular Microbiology and Ecology and performed his postdoctoral training at the Johns Hopkins University in the Department of Chemistry working on microbial natural product chemistry. Dr. Ravel is also the Editor-in-Chief of the journal Microbiome and an Associate Editor for the journal mBio. Greg Sieczkiewicz, JD, PhD is Managing Director and Chief IP Counsel at MPM Capital. Prior to joining MPM, Greg was the architect of IP strategy for over a dozen venture-backed life sciences companies across the spectrum—from nucleic acid therapeutics, oral biologics, the microbiome, to oncology. In his most recent role, Greg served as Vice President, Intellectual Property at Flagship Ventures where, among other accomplishments, Greg drove the issuance of first-in-field US patents for oral biologics and served as the IP architect and co-inventor of an industry-leading nucleic acid therapeutics patent estate. Greg has crafted the IP strategy and led the initial filing for multiple life sciences companies that are committed to changing the face of medicine across the spectrum. Greg is a member of the bar of the Commonwealth of Massachusetts and is admitted to practice before the United States Patent and Trademark Office. Greg is the current President of the Boston Patent Law Association.